Suit 150-250mm centrifugal fans. Please specify flange required or it will be sent with a 250mm. Sug.. Suggested for use up to 2000W of lighting. 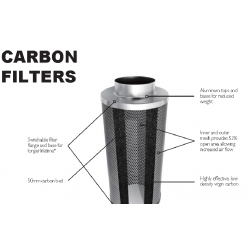 Supplied..
750MM Heavy duty Carbon filter. Lasts Years. Choice of flange sizes. 200 - 300mm ..
One of the largest in the CAN filter range. this beast will handle the biggest 2 pole HIGH FLOW fans..
Can fan-filter combo RK100 can fan, GT300 filter to suit 400W systems. Fan and filter combo to suit 400W environments. RK100 100mm centrifugal fan with GT300 filter. ..
Can fan-filter combo RK125 can fan, GT300 filter to suit 600W systems. Fan and filter combo to suit 600W environments. RK125 125mm centrifugal fan with GT300 filter. .. Suitable for 400W systems. 100mm-125mm centrifugal fans. Comes with 100mm.. Smallest in the Can filter range. Can Lite GT150. 100mm flange supplied. Can fit 125mm flange on req..
Lightweight Carbon High Flow filter. Outside Diameter: 350mm Max Flow Rate: 650 L/S Height: 1000mm..
We are overstocked with this great fan filter combo. Greenpower 250mm Centrifugal Fan with 250mmx500..
150mm x 400mm Carbon filter. Removes unwanted odours. Durable construction with prefilter included. ..
250mm x 500mm Carbon filter. Removes unwanted odours. Durable construction with prefilter included. ..
ProBlock odour neutraliser. These don't just mask smell, they destroy the molecules that cause the s..
Ozone is a naturally occuring.. Perfect for tents and small rooms. Ozone is a naturally occuring..